Rabbani, M., Heidari, N., Farrokhi Asl, H. (2016). A Bootstrap Interval Robust Data Envelopment Analysis for Estimate Efficiency and Ranking Hospitals. Journal of Industrial Engineering and Management Studies, 3(2), 107-122. M. Rabbani; N. Heidari; H. Farrokhi Asl. "A Bootstrap Interval Robust Data Envelopment Analysis for Estimate Efficiency and Ranking Hospitals". 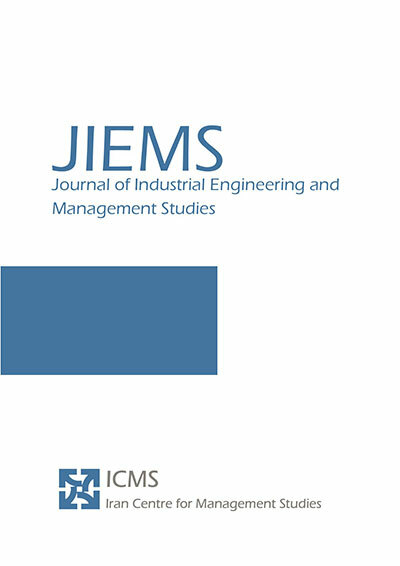 Journal of Industrial Engineering and Management Studies, 3, 2, 2016, 107-122. Rabbani, M., Heidari, N., Farrokhi Asl, H. (2016). 'A Bootstrap Interval Robust Data Envelopment Analysis for Estimate Efficiency and Ranking Hospitals', Journal of Industrial Engineering and Management Studies, 3(2), pp. 107-122. Rabbani, M., Heidari, N., Farrokhi Asl, H. A Bootstrap Interval Robust Data Envelopment Analysis for Estimate Efficiency and Ranking Hospitals. Journal of Industrial Engineering and Management Studies, 2016; 3(2): 107-122. 1School of Industrial Engineering, College of Engineering, University of Tehran. 2School of Industrial Engineering, Iran University of Science & Technology, Tehran, Iran. Data envelopment analysis (DEA) is one of non-parametric methods for evaluating efficiency of each unit. Limited resources in healthcare economy is the main reason in measuring efficiency of hospitals. In this study, a bootstrap interval data envelopment analysis (BIRDEA) is proposed for measuring the efficiency of hospitals affiliated with the Hamedan University of Medical Sciences. The proposed method is capable to consider uncertainty and sampling errors. The inputs of this model include total number of personals, number of medical equipment, and number of operational beds. Also, outputs consist of number of inpatients, number of outpatients, number of special patients, bed-day, and bed occupancy rate. First, we estimate the efficiency by applying original DEA that does not consider any uncertainty and sampling error; then we utilize RDEA that considers uncertainty and after that we use BRDEA that consider both uncertainty and sampling error with an adaptation of bootstrapped robust data envelopment analysis and could be more reliable for efficiency estimating strategies. Andersen, P., & Petersen, N. C., 1993, A procedure for ranking efficient units in data envelopment analysis. Management science, 39(10), 1261-1264. Angulo-Meza, L., & Lins, M. P. E., 2002, Review of methods for increasing discrimination in data envelopment analysis. Annals of Operations Research,116(1-4), 225-242. Ben-Tal, A., & Nemirovski, A., 1999, Robust solutions of uncertain linear programs. Operations research letters, 25(1), 1-13. Bertsimas, D., & Sim, M., 2004, The price of robustness. Operations research, 52(1), 35-53. Charnes, A., Cooper, W. W., & Rhodes, E., 1978, Measuring the efficiency of decision making units. European journal of operational research, 2(6), 429-444. Chowdhury, H., & Zelenyuk, V., 2016, Performance of hospital services in Ontario: DEA with truncated regression approach. Omega, 63, 111-122.
Cooper, W. W., Ruiz, J. L., & Sirvent, I., 2007, Choosing weights from alternative optimal solutions of dual multiplier models in DEA. European Journal of Operational Research, 180(1), 443-458. Dotoli, M., Epicoco, N., Falagario, M., & Sciancalepore, F., 2015, A cross-efficiency fuzzy data envelopment analysis technique for performance evaluation of decision making units under uncertainty. Computers & Industrial Engineering, 79, 103-114. Fiallos, J., Patrick, J., Michalowski, W., & Farion, K., 2015, Using data envelopment analysis for assessing the performance of pediatric emergency department physicians. Health care management science, 1-12. Hafezalkotob, A., Banihashemi, M. H. S., Akhavan, E., & Tavakoli, R. H., 2014, Robust approach to DEA technique for supplier selection problem: A case study at Supplying Automotive Parts Company (SAPCO). Journal of Industrial and Systems Engineering, 7(1), 56-79. Jalali Naini, S. G., & Nouralizadeh, H. R., 2012, A two-stage DEA to analyze the effect of entrance deregulation on Iranian insurers: a robust approach. Mathematical Problems in Engineering, 2012. Kalantary, Z., & Azar, A., 2014, A ROBUST DATA ENVELOPMENT ANALYSIS MODEL FOR RANKING: A CASE OF HOSPITALS OF TEHRAN. Data Envelopment Analysis and Performance Measurement, 21. Kazley, A. S., & Ozcan, Y. A., 2009, Electronic medical record use and efficiency: A DEA and windows analysis of hospitals. Socio-Economic Planning Sciences, 43(3), 209-216. Lam, K. F., 2015, In the determination of the most efficient decision making unit in data envelopment analysis. Computers & Industrial Engineering, 79, 76-84. Lu, C. C., 2015, Robust data envelopment analysis approaches for evaluating algorithmic performance. Computers & Industrial Engineering, 81, 78-89. Markovits-Somogyi, R., 2011, Ranking efficient and inefficient decision making units in data envelopment analysis. International Journal for Traffic and Transport Engineering, 1(4), 245-256. Misiunas, N., Oztekin, A., Chen, Y., & Chandra, K., 2016, DEANN: A healthcare analytic methodology of data envelopment analysis and artificial neural networks for the prediction of organ recipient functional status.Omega, 58, 46-54. Mitropoulos, P., Talias, Μ. A., & Mitropoulos, I., 2015, Combining stochastic DEA with Bayesian analysis to obtain statistical properties of the efficiency scores: An application to Greek public hospitals. European Journal of Operational Research, 243(1), 302-311. Omrani, H., 2013, Robust data envelopment analysis model with fuzzy perturbation in inputs and outputs. International Journal of Industrial and Systems Engineering, 15(4), 426-442. O’Neill, L., Rauner, M., Heidenberger, K., & Kraus, M., 2008, A cross-national comparison and taxonomy of DEA-based hospital efficiency studies.Socio-Economic Planning Sciences, 42(3), 158-189. Özkır, V., & Demirel, T., 2012, A fuzzy assessment framework to select among transportation investment projects in Turkey. Expert Systems with Applications, 39(1), 74-80. Podinovski, V. V., & Thanassoulis, E., 2007, Improving discrimination in data envelopment analysis: Some practical suggestions. Journal of Productivity Analysis, 28(1-2), 117-126. Rezaee, M. J., & Karimdadi, A., 2015, Do geographical locations affect in hospitals performance? A multi-group data envelopment analysis. Journal of medical systems, 39(9), 1-11. Sadjadi, S. J., & Omrani, H., 2008, Data envelopment analysis with uncertain data: An application for Iranian electricity distribution companies.Energy Policy, 36(11), 4247-4254. Sadjadi, S. J., Omrani, H., Abdollahzadeh, S., Alinaghian, M., & Mohammadi, H., 2011, A robust super-efficiency data envelopment analysis model for ranking of provincial gas companies in Iran. Expert Systems with Applications, 38(9), 10875-10881. Seiford, L. M., 1996, Data envelopment analysis: the evolution of the state of the art (1978–1995). Journal of productivity analysis, 7(2-3), 99-137. Simar, L., & Wilson, P. W., 1998, Sensitivity analysis of efficiency scores: How to bootstrap in nonparametric frontier models. Management science,44(1), 49-61. Simar, L., & Wilson, P. W., 2000, A general methodology for bootstrapping in non-parametric frontier models. Journal of applied statistics, 27(6), 779-802. Shokouhi, A. H., Hatami-Marbini, A., Tavana, M., & Saati, S., 2010, A robust optimization approach for imprecise data envelopment analysis.Computers & Industrial Engineering, 59(3), 387-397. Shokouhi, A. H., Shahriari, H., Agrell, P. J., & Hatami-Marbini, A., 2014, Consistent and robust ranking in imprecise data envelopment analysis under perturbations of random subsets of data. OR spectrum, 36(1), 133-160. Shokouhi, A. H., & Shahriari, H., 2015, An Integrated Model with Conservative Levels to Evaluate the DMUs Efficiencies for Uncertain Data.Iranian Journal of Operations Research, 5(1), 29-46. Staat, M., 2002, Bootstrapped efficiency estimates for a model for groups and hierarchies in DEA. European Journal of Operational Research, 138(1), 1-8. Yousefi, S., Shabanpour, H., Fisher, R., & Saen, R. F., 2016, Evaluating and ranking sustainable suppliers by robust dynamic data envelopment analysis. Measurement: Journal of the International Measurement Confederation, 83, 72–85. https://doi.org/10.1016/j.measurement.2016.01.032.